Catholic Formation in 9th & 10th grade is a prerequisite for Confirmation as a junior. Click on your home parish to pay tuition. Teen Nights are evenings that include large group community time with prayer, worship and vibrant speakers followed by intentional small groups. Our goal at Teen Night is to provide an opportunity for teens to be engaged in their faith through dynamic speakers and activities, to make these experiences personal through individual prayer and small group discussion, and to root each teen in their faith that will sustain them during their hectic week. We recognize that Monday evenings are not always possible for teens to make. For this reason, we offer Independent Teen Nights (ITN), which encompass similar components of our Teen Nights, for teens to elect to participate. There are 40-50 ITNs offered throughout the year, including reciprocity with Holy Family/St Robert’s Teen Nights. It is the responsibility of teens, with the guidance of their parents, to plan their schedule accordingly. 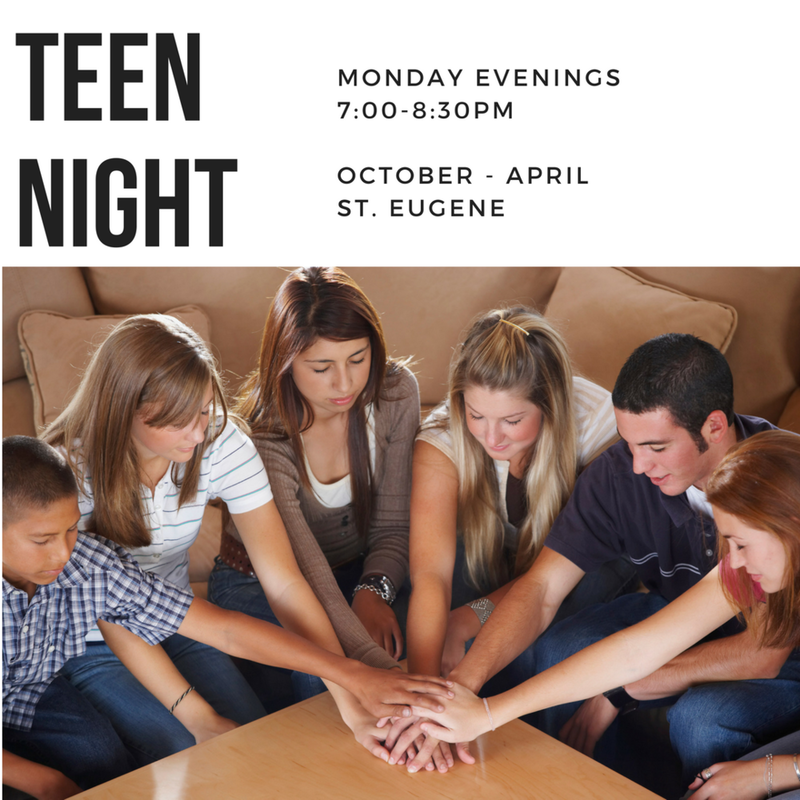 We want to welcome incoming Freshmen to High School and introduce the growing formation ministry of Teen Nights, that are offered to all 9th and 10th graders beginning this Fall through St. Eugene and St. Monica (STME) Youth Ministry. Beginning this Fall of 2018, all incoming freshmen will be require to attend Teen Nights both Freshman and Sophomore years as preparation for Confirmation during Junior Year. Regular Sunday Mass attendance is expected of our Teens and families. Out of town? www.masstimes.org will help you find a local Catholic Mass! ¨ Teens attending public school are expected to participate in 14 teen nights each year. ¨ Teens attending Catholic Schools are expected to participate in 5 teen nights each year. Teens are expected to serve a minimum of 15 hours each year as 9th & 10th grade students. At least half of those hours must be serving your home parish. Hours are accumulated July 1-June 30th. Information for Liturgical Ministries will be provided in the beginning of the year and other parish opportunities will be updated as they arise. It is the responsibility of each teen to set up his/her own opportunities to serve.